To pay by credit or debit card, you need to fill in your card details using the form on the left hand side of the screen. Clinking the "Continue" link will take you to the page that will allow you to enter your card details. To pay using your paypal account, go to your cart (click here to see your cart) and then proceed through the 3 stage checkout process. Once you click the "Confirm your order" button, you will get taken to paypal and will see a screen similar to the one shown above. 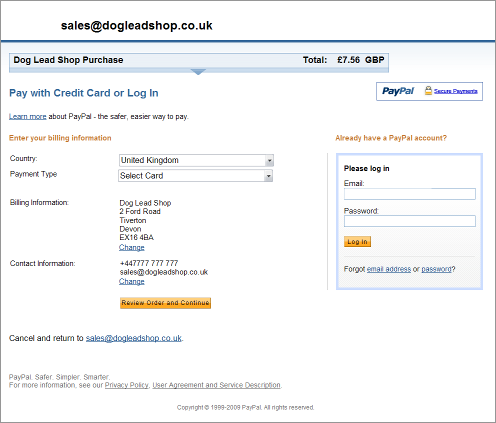 You then need to enter your paypal account details using the form on the right hand side of the screen.